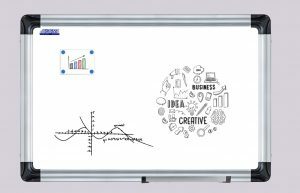 Educreations is an interactive whiteboard tool that allows educators and students alike to design more enhanced and engaging presentations. 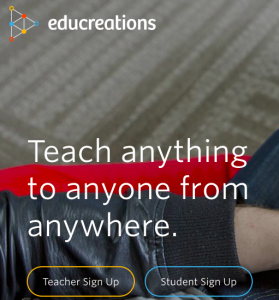 On the Educreations site or iOS app, users can record, share, and view interactive lesson plans. Users can import images into their whiteboard with the free version and mark them up in real time up on a screen. This tool would be valuable for a variety of lessons. Sentence structuring, labelling diagrams, or even just playing games and tallying the score. Educreations makes the whiteboard process faster and more versatile for everyone. Augmentation: The interactive whiteboard has the ability to do more than a traditional one, though, and a teacher or student can easily and seamlessly incorporate documents and graphics into the whiteboard. Modification: A teacher can post video or interactive lessons on Educreations that students can follow along with at their own pace, in school or at home. This can lead to more class time spent on hands on activities and larger discussions. Redefinition: Students have the opportunity to create their own content for the teacher and their fellow students to see. This can allow for more engaging assignments, and lead students to develop a mastery of the subject matter by assisting in teaching their fellow classmates. Far too often, technology is used as a direct substitute for other low-tech tools (e.g., pencil and paper). While substitution has some benefits (e.g., students develop their technology skills and knowledge), we encourage you to think about how you might use Educreations to modify or redefine learning. Math: The interactive whiteboard, with uploadable graphics and tables, makes math come alive. Students can go at their own pace and even show their work more easily, allowing teachers to assist them more easily. Science: Interactive labs are easy with Educreations. Advanced postings let students who may learn differently work at their own pace and students can share their individual steps following the scientific method with their teacher and fellow classmates. English/Language Arts: Guided reading notes and literature/poetry analysis becomes much more lively when used alongside the Educreations interactive whiteboard. Social Studies: Marking up documents as part of a video lesson is easier and much more readily accessible with Educreations. Also, with student based creation, practicing document analysis with a video recording allows students to share their methods and findings with each other. On the website or on the app, there will be a “+” icon that allows you to create a new lesson. Clicking this will open up the whiteboard and start a voice recording. Draw on your whiteboard, drag and drop images from your camera roll, and narrate in real time. When finished, there is a “Done” button in the top, left corner of the screen. It will give you the option to save your lesson, or to start over. Ibrahim, M. & Watts, A. (2014). Examining the Effect of Using Voicethread and Educreations on Preservice Teachers’ Self Efficacy and Learning Outcome in Online Course. In M. Searson & M. Ochoa (Eds. ), Proceedings of SITE 2014–Society for Information Technology & Teacher Education International Conference (pp. 554-560). Jacksonville, Florida, United States: Association for the Advancement of Computing in Education (AACE). Retrieved November 14, 2018 from https://www.learntechlib.org/primary/p/131143/.